The long wait at the ticket office of the Sagrada Familia won't affect you! Having chosen the convenience of making a quick booking on-line for your tickets, you will have immediate access to the basilica, a symbol without equal of the city of Barcelona. Buy your tickets with immediate access on this page: you'll save both time and money. In fact, not many people are aware of the fact that buying tickets at the ticket office means paying an additional cost (to cover printing of the entry tickets). In order to get in to the Basilica, there are three different accesses: the main entry is in the Calle de Larrard and the others are from the Carretera del Carmel and from the Pasaje de Sant Josep de la Muntanya. Buying tickets from the ticket office is not recommended, firstly because of the surcharge and secondly because there is only one ticket counter (just at the main entrance) so this can generate very long queues. The presence of just one ticket counter does mean a more controlled flow of visitors into the building and less waiting time for those who have already bought their entry tickets. Buy your entry tickets on-line and you will have a much faster access to the basilica. In order to avoid long queues at the entrance, it is strongly recommended that you purchase your tickets on-line. On the day of your visit: Just show the entry tickets on your smartphone and remember to be on time as they are quite strict about timings due to the volume of visitors. The Sagrada Familia, stays open every day of the year from 09:00 to 19:00 hours. The latest permitted entry to the basilica is at 18:00, in other words, an hour prior to closing. During religious celebrations, it is possible to participate in the Mass but it is not possible to make a tour with a guide or even by yourself. We would advise you to pay attention to your clothing, as this is a church, staff at the entrance can prohibit entry due to unsuitable attire. 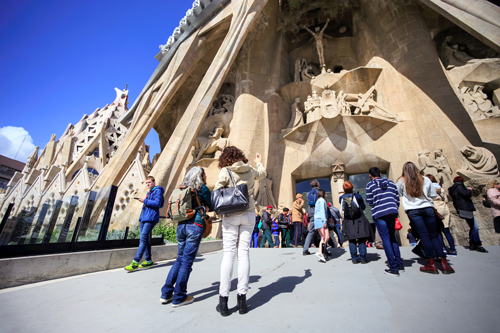 In order to use an audio-guide, choose to purchase your tickets on-line or download the App because you can't purchase an audio-guide from the ticket office..
For further information, visit the web page: Sagrada Familia. Read some of the fascinating history that surrounds the construction of this unquestionable symbol of Catalonia, the Sagrada Familia. Find out the easiest way to get to the Basilica, opening times and plenty of other relevant information. Do you want to get the maximum our of your visit to the Sagrada Familia? Then transform your visit into a real voyage of exploration with a local guide who speaks your language. In order to make a reservation, simply fill out the form on the web page: English speaking Guide Barcelona. Choose to be accompanied by a fun guide who is well prepared and will be accompanying visitors around this marvellous masterpiece of modernist architecture. In a fast and fun way you will learn about and find out information which you would never have discovered on your own unless you had found it in a book!